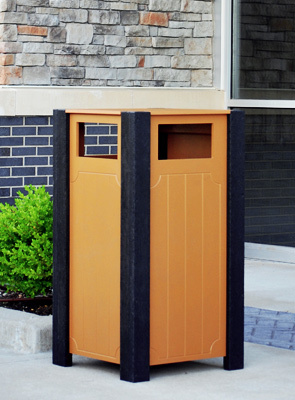 This recycled plastic trash receptacle is made with various sized Resinwood slats. The modern styling of this receptacle will blend into any commercial setting and is an excellent match to the recycled plastic tables and benches shown. Available only in cedar with black trim. Liner sold separately. Post-consumer waste such as milk jugs, pop bottles, and plastic bags are the main ingredients in this trash receptacle, and to top it all off, the receptacles themselves are also recyclable. Help reduce the pollution of landfills with trash receptacles that can be enjoyed for generations to come.